My sister let me do her eye makeup. Check out these sweet rainbow lids! Prime your lids with white-ish eyeshadow. 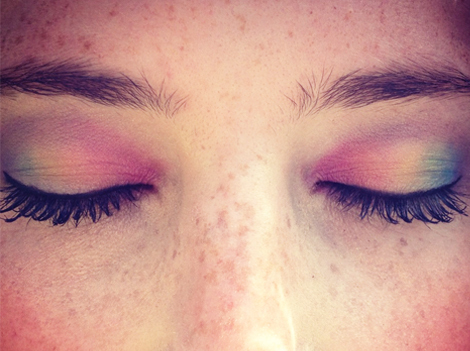 Pick up a small brush, and stripe your eyelid with the colors of the rainbow. Staring by the tear ducts and working out towards the temple, apply: magenta, orange, yellow, green, blue, and a tad of purple on the outer corner of your eye. It’s okay for your stripes to overlap the previously applied color – this will help blend the rainbow. Clean your makeup brush between each color stripe. Once your rainbow looks great, put a little bit more purple shadow on your brush, and gently sweep it from the purple corner across the crease of your lid, towards the magenta stripe by your tear ducts. Beautiful! This will give your makeup some added dimension and make your eyes appear deeper set. To finish the look, thinly line your lid with a well-sharpened black pencil. Apply two coats of mascara, and you’ll look like a star! Ombré eyes. How young, fresh and of the moment! (And this look is way more practical than ombré lips which I really don’t understand.) The color possibilities are endless. What a fun application and look! this makes me want to do my eyes! Tessa, could this be done using only shades of red and green?